← Point/Counterpoint: Would You Drink Hydrating Beer With Less Alcohol? To start things off, we’ve found five stories about beer that we think you, as Americans, should be kept aware of. Maybe you’ve read articles about some of these developments already, but hopefully you’ve since drunk enough beer that they remain only a fuzzy memory, much like that frozen burrito that you found in your microwave when you groggily woke up this morning. Don’t worry, it’s happened to all of us, nuke it for another two minutes and you’ve got yourself a somewhat palatable breakfast. We’re not going to judge. So hunker down, get yourself a cold compress, and try to ignore that churning feeling in your stomach as you think about alcohol about 12 hours before it sounds like something you’d be able to consider drinking again, and let’s take a look at this week’s top stories in beer news. Canada is like America’s pesky little brother that, despite all its good intentions, will never be as cool and popular as us. We don’t hold that against them, we toss them a basketball or baseball franchise here and there to make up for the fact that we stole their sport and made sure they can never win it, and our teenagers thank them by occasionally taking road trips to the nearest border city (Hey Windsor, how you living?) to take advantage of their lower legal drinking age. Of course, this “emulating America, but usually not surpassing America” approach applies to beer as well. Canada loves beer, and a Molson will get you drunker faster than, say, a Budweiser. But there’s no Canadian beer that anyone outside of Canada particularly loves (except for, perhaps, Unibroue, but they’re all French so that almost doesn’t count). Yes, Canada typically makes okay-not-great beer, and there’s nothing wrong with that, since they at least have a healthy appreciation for the stuff. 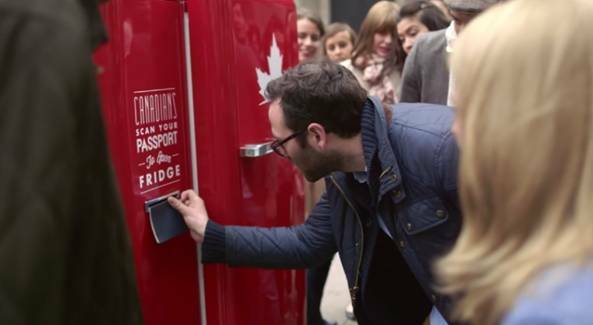 But this past week, Molson decided to taunt Americans throughout the world by placing public fridges throughout Europe stocked with free beer that can only be accessed by Canadians with valid passports. Molson recently reintroduced their slogan of “I Am Canadian” which, you know, shrug, but these fridges act as a publicity stunt to bring that slogan home. The government shutdown has not exactly been a shining example of American’s awesomeness. Pretty much every member of every political party is pissed off, and it’s a massive inconvenience to everyone in this fair nation. Of course, some people are affected more negatively than others—workers in the private sector aren’t sweating it out nearly as much as the government employees who don’t know when they can expect to receive paychecks. Our staff at AFFotD felt we were lucky during the shutdown, since we weren’t really affected by much of the shutdowns. They closed the national monuments, but we’ve been to all of them so much we’ve lost count. They shut down the national parks, and we didn’t care because nature is our sworn enemy and we’ve always been iffy on the whole “designating parts of America for nature” thing to begin with. But then, they came after our beer. And that, we cannot abide. 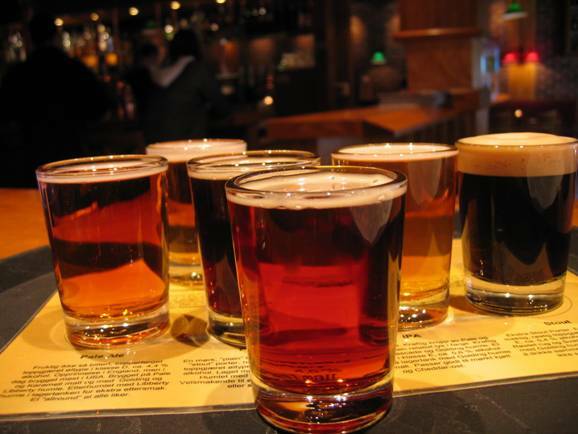 American craft beer is one of the most rapidly expanding and inventive beer industries in the world. We’re not only finding new twists on old favorites, we’re actively inventing new styles of beer regularly. Now, what does this have to do with the government shutdown? 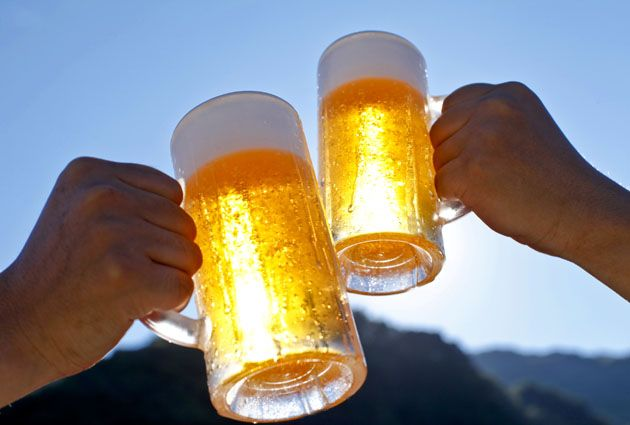 Well, as the president and congress continue to bicker over the finer points of sharing, the Alcohol and Tobacco Tax and Trade Bureau (or TTB for short) isn’t able to perform one of its most essential duties (heh, duty)—they can’t approve new beers for next season. The TTB has to give their seal of approval before we can get any new breweries, beers, or beer labels, meaning that even something as simple as establishing a beer tasting room in a brewery has to go on hold until funding is restores. So complain all you want about our lack of a Panda Cam during the government shutdown, what you should really be upset about is the lack of Panda Beer. Remember the name of sixth-grader Michal Bodzianowski, because at the age of 11, this kid has his priorities in line better than most 30-year-olds. He submitted a project idea to the Student Spaceflight Experiments Program, which chooses experiments designed by students to perform on the International Space Station. Bodzianowski saw how beer was an important alternative to water in the Middle Ages, partly because it was cleaner than drinking water back then, but mainly because if you lived in the Middle Ages you’d want to be wasted 24/7 to get through it. Because Bodzianowski is a future AFFotD writer waiting in the wings, he decided that this approach would be good to use in space, especially if there were some sort of space emergency that affected the water supply. Because of this brave young American, astronauts will send up hops, barley, water, and yeast to the ISS in December and will see if they can make beer. 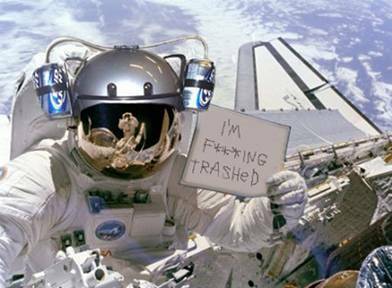 We’re going to go out on a limb here and say that every single astronaut we have will be volunteering for this mission. A project currently being (hopefully) funded through a kickstarter campaign is Brewbot, a robot that makes whatever beer you tell it to. While it’s not quite as simple as all that, it does manage to make home brewing easy enough that most people won’t have an excuse to buy Miller Lite anymore. 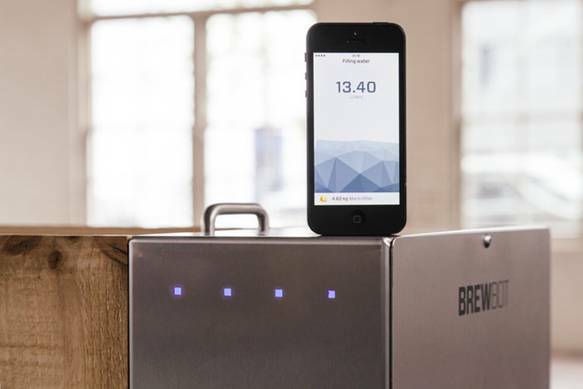 The 250 pound Brewbot machine works through an iPhone app, and automatically metes out the correct amount of water, heating it to the proper temperature, and then draining it into storage where it can begin fermenting. You simply buy your brewing ingredients, put it in the machine, and set everything up in your phone or iPad, and wait a few weeks for delicious, mind-numbing booze. For those of you who have brewed your own beer, it can be a labor intensive affair. And while many enjoy that aspect of the brewing process, an even greater amount of Americans are lazy slobs who would still love to drink beer they made with their own hands (or, rather, the machines they purchased from their own internet). It might be a bit premature, but we’re predicting that this will be the best invention for lazy beer snobs since Lay-Z-Boy started offering armchairs with cup holders big enough to fit 750-ml beer bottles. 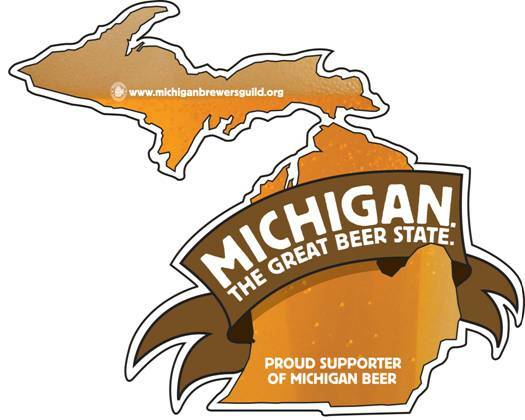 We’ve long been vocal supporters of Michigan’s appreciation for craft beers, but a recent bill introduced in Michigan shows that Michigan cares about the beer drinker more than most states. When we drink beer, it typically comes in 12-ounce bottles or cans, or in pints, which give you four more precious ounces of hoppy malted goodness. Of course, when you order a beer on draft, you expect a pint…though you might not always get your full allotment of delicious. Reps. Brandon Dillon and David Knezek helped introduce the amendment to the Liquor Control Act to make sure that when you order a pint, you get a pint goddamnit, making it an offense to “advertise or sell any glass of beer as a pint…unless that glass contains at least 16 ounces of beer.” It’s beautiful in its simplicity—a pint is a pint, and don’t you forget it. While the concept of protecting against false advertising isn’t that unusual, it does feel rare for a state to take such a strong stand specifically in favor of their citizens getting drunker. And for that, Michigan, we salute you. This entry was posted in Beer! 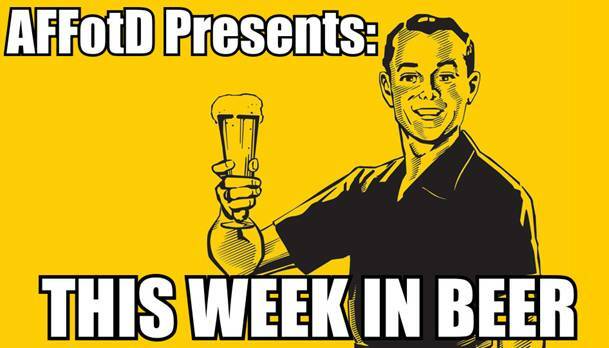 and tagged America, Beer, Brewbot, Canada, michigan, Molson, Space, This Week In Beer. Bookmark the permalink.